The mysterious allure of Antarctica has long attracted the more adventurous and daring among us to explore its ice-choked shores. Today, this most unconventional destination tops all kinds of dream travel and bucket lists. Whether planning to set foot on the 7th Continent for the first time or planning a second, third (or maybe twenty-third) trip, Quark Expeditions’ passengers are geared up for the most epic Antarctic season yet! 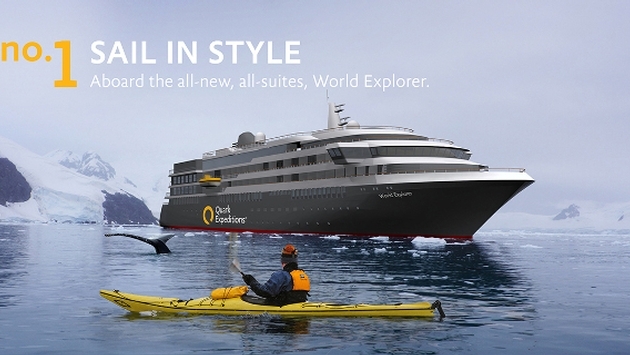 Quark’s new 5-star luxury vessel, the World Explorer, will be ready to launch just in time for the 2018-2019 season. Designed with polar travel in mind, its luxurious all-suite, all-balcony design will ensure you never miss a stunning view. The ship will feature a hybrid engine, an outdoor running track, dedicated spa area, outdoor heated pool, gym, sauna and a glass domed observation lounge. Pair those amenities with the 5-star chef prepared meals, and you'll find yourself never wanting to leave. Experience a wildlife safari unlike any other! Quark’s South Georgia and Antarctica: Penguin Safari hits up some of the most popular places to spot our black & white friends, including King, Rockhopper and Gentoo species. For those looking to come home with some truly breathtaking photos, Quark has designed two new Photography Series for the 2018-2019 season: Antarctic Explorer, and Crossing the Circle. They feature onboard photography experts, more time spent at photogenic sites, and onboard lectures and workshops. Word of advice: bring plenty of memory cards! Feel like you've seen all there is to see? Think again. South Georgia is nicknamed the Galapagos of South Atlantic and our newest voyage, Falklands (Malvinas) and South Georgia: Islands of the Southern Ocean, is perfect for both past passengers who wish to experience a new part of the Southern Ocean, or anyone looking for an in-depth South Georgia expedition. New this season, Quark will cover all gratuities for our amazing team of dedicated crew members. That means less for you to worry about on your adventure. February 2 is World Whale Day! Lucky passengers may get a glimpse of majestic humpback whales and orcas below the icy waters. If whale watching is what you are after, we recommend our Crossing the Circle voyage. The best time to see them is late in the season. We've heard that you want more time on some of our most popular voyages. 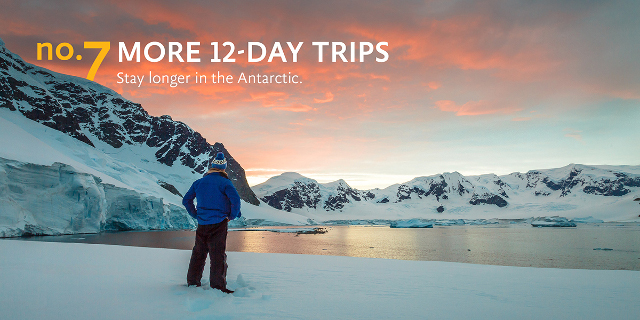 We'll now be offering 12-day itineraries, including the Antarctic Explorer, which means you'll have even more time for exploration in the Antarctic. With an arresting display of wildlife, glaciers and fjords, the mountainous islands are a beautiful pit stop. On South Georgia, the King penguin rookeries are at their most impressive and macaroni penguins are in their greatest numbers in March, so this is a great time to book Falklands, South Georgia, and Antarctica! With a population of only about 4,000 people during the Austral summer, Antarctica is the most exclusive continent on which to ring in the New Year. Our recommended voyage on which to pop the cork is the Antarctic Express: Fly the Drake, departing Friday, Dec. 28, 2018. The late season in Antarctica means stunning sunsets and pristine night skies far away from any light pollution. During your Crossing the Circle voyage, stay out on the deck long enough and maybe you'll spot a shooting star! Visitors in December and January may be able to see one of the cutest sights in one of the coldest parts of the world: newly hatched penguin chicks. Get a glimpse of penguin parents tending to their fuzzy, young hatchlings on the Antarctic Explorer: Discovering the 7th Continent voyage departing Jan. 8, 2019. Jan. 20 is Penguin Awareness Day. And there is no one more aware than the world's top penguinologist, Dr. Tom Hart. Experience his limitless well of penguin knowledge at one of his onboard lectures, or simply sidle up to him during dinner. Heavy ice conditions can make crossing the Antarctic Circle difficult or even impossible, but that won't stop us from trying! On the Antarctic Express: Crossing the Circle voyage, experience true exploration, as we attempt to be the first passengers of the season to cross the circle at 66 degrees 33' in the Southern Hemisphere. Give you and your family a gift you'll never forget: Quark’s Crossing the Circle voyage is an epic Antarctic expedition taking place over the holiday season. No wrapping paper required. On early November's Antarctic Explorer expedition, you'll have the chance to witness the unique mating rituals of the Gentoo penguins. They begin courting and building their nests out of pebbles, and sometimes they offer pebbles to their mates as a form of courting. The austral spring season also means the Antarctic ice is at its most spectacular and pristine – catch a glimpse before it floats away! When booking the Ocean Endeavour, the transfer package between Buenos Aires and Ushuaia is now optional. That gives you the chance to explore stunning Tierra del Fuego and Patagonia before or after your Antarctic Explorer voyage. Witness playful aquatic mammals, including Fur seals, Weddell seals, and the distinctly snouted Elephant seals, all in their natural habitat. March 22 is the International Day of the Seal, and there’s no better way to celebrate than seeing these fun creatures in their natural habitat. Treat yourself after a day of Antarctic exploration. Starting this season, all dinner services on all ships will now include beer and wine. Cheers to that! With a number of voyages happening over Valentine's Day, including Antarctic Explorer and Crossing the Circle, make it a romantic getaway. Just don't melt all the ice. With a little notice, Quark can also accommodate weddings on board. November is springtime south of the equator, which means it's the perfect time for blooming wild flowers in South Georgia and playful Weddell, Elephant and Fur seals. There’s a lot more to learn about the sights, sounds and experiences Antarctica has in store for you! Planning your Antarctic adventure for 2018/2019 right now gives you access to discounts on single supplements, a lower booking deposit, exclusive perks, and huge savings on select standard and premium cabins. It’s all part of Quark’s Early Booking Bonuses, on now until Sept. 30, 2017. After traveling extensively from a young age, Meg decided to turn her passion for travel into a full-time career. Now with more than 20 years of experience in supplier management and retail marketing in leisure travel, she’s held numerous positions in product development, national account management, and sales and market distribution in the travel industry. Meg joined the Quark Expeditions team in 2016.